Cairns is definitely the place to be on New Years Eve. The city centre comes alive and all the bars and nightclubs are packed. 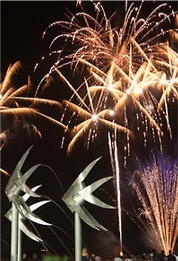 There's free fireworks on the Esplanade at both 9pm and midnight, as well as free family entertainment. This is pretty much a family event, so if you're looking to party hard then maybe look for a licensed venue. Another great option, especially for travellers (although also really popular with locals) is to join one of the organised New Years Eve Party Tours. These will give you VIP entry to 3 different venues as well as games, fun and prizes. One of the most popular Cairns New Years Eve options is the Fitzroy Island Beach Party - there's 2 boats to the island at different times. With a live band as well as some of Cairns top DJ's this certainly is a great way to welcome in the New Year.